There are a lot of benefits to buying a large cut of meat, even if you’re a family of two like we are. You may pay what seems like a lot at the start, but if you’ve got a few hours to spend on the initial prep and cooking, and you don’t mind remixing leftovers, you’ll get a lot of bang for your buck. 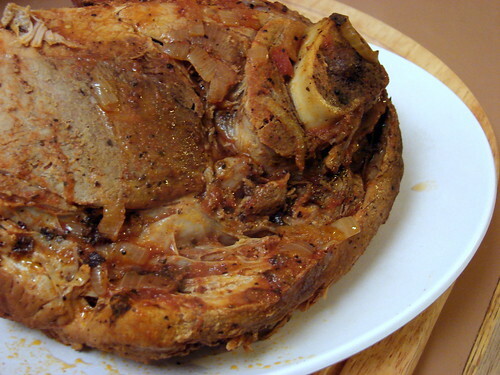 Our latest big meat cycle was based on a bone-in pork shoulder. We brought home a piece from the folks at Stoney Hill Cattle on Saturday (weighing in at a little under 5 lbs, at a cost of about $23), and on Sunday I cooked it up. 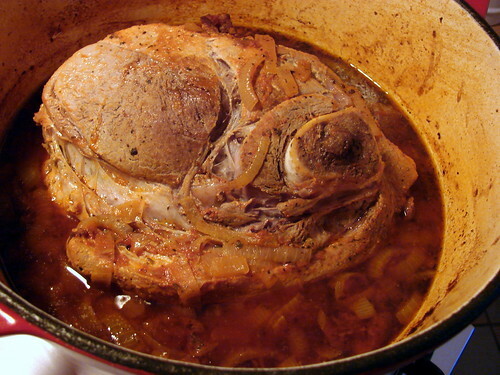 One of my favorite ways to cook pork shoulder is in a rich, chile-spiced broth, and that’s just what I did this time. I set our biggest enameled cast iron pot over pretty high heat and added about two tablespoons of rendered pork fat (lard, fatback, even leftover bacon grease will work here). When the fat was sizzling, I placed the pork shoulder, which I had seasoned all over with kosher salt, into the pot and let it get really brown on the first side. 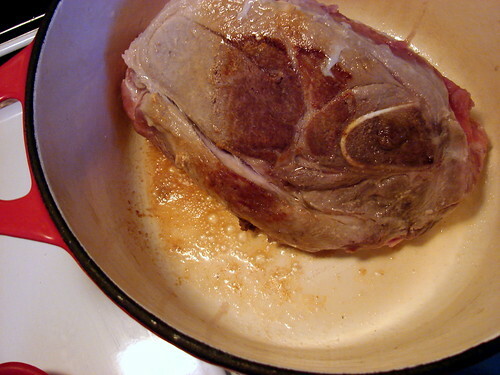 When it had developed a good crust, I flipped it, repeating the process until all sides of the meat were browned. I removed the meat and set it aside, reducing the heat to medium and adding about two cups of thinly sliced onion and a good pinch of kosher salt. I cooked the onion until soft, then added my spices to toast them – about 2 teaspoons each of Mexican oregano and ground cumin, and a tablespoon of our house chile powder. I let them go a minute or two before adding an ounce of sherry vinegar (stand back from the pot and don’t inhale when you add it! ), two cups of tomato puree (I used the liquid left over from various cans of whole peeled San Marzanos which I had been saving in a container in the fridge), and a cup of water. I let this simmer on the stovetop briefly, being sure to scrape up all of the brown porky bits from the bottom of the pot as I stirred, then I added the pork shoulder back to the pot and lidded it up. This went into a 300 degree oven for two hours, at which time the meat was separating from the bone and the internal temperature was just under 160. At this point I turned the heat off and left the covered pot in the oven for an additional hour because I wasn’t ready for it yet, but you could, after giving the meat a brief rest, just slice or chunk it up and serve it. This is exactly how we start many of our pork shoulder cycles, but this time I had other plans. I separated about 1/3 of the meat from the shoulder, cut it into small chunks, and browned the bits in a little more melted pork fat until they were crispy. 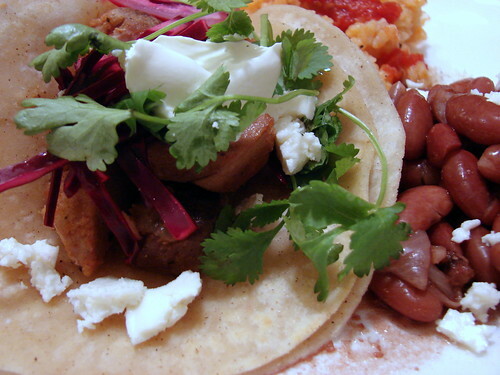 I tossed the pieces with a small amount of the braising liquid and served these carnitas in warm tortillas, dressed with queso fresco, salsa, shredded cabbage, sliced radish, fresh cilantro and plenty of freshly squeezed lime juice. We ended up with enough for dinner and leftovers for lunch the next day – and we still had more pork shoulder to go. My plan for meal two was to do something similar to pulled pork. I cut most of the rest of the meat from the bone (about 3-4 cups, chunked), placed it in a heavy-bottomed pot and added 3 cups of the reserved liquid from the initial braise. I let this cook until the meat was very soft, removed the chunks from the liquid, and tore it into shreds with two forks. 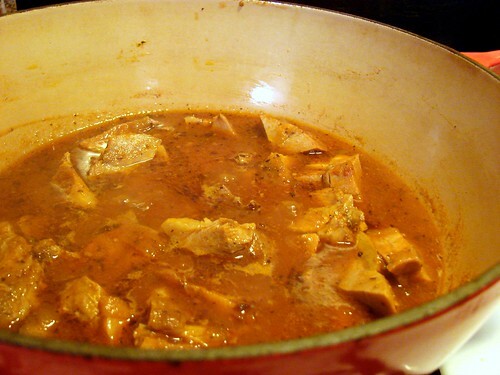 I returned the meat to the pot, added an ounce of vinegar (I used red wine vinegar, but cider vinegar would work well here too), and continued cooking the pork over low heat until the meat was meltingly soft and the liquid reduced to a saucy glaze. We piled the pork onto small soft brioche rolls with sliced homemade pickles, and served additional pickles, a quick cabbage/fennel/carrot slaw, and oven fries on the side. There’s shreddy pork left over for Mike’s lunch today, and the remainder of the shoulder – the bone and meaty bits still clinging to it – will be the base for a hearty bean soup in the near future. The 23 bucks we spent on that shoulder seems like a flat-out bargain now. I took the rest of the shreddy pork and a bit of leftover braising liquid, warmed it up and cooked it down, and spread it into three heated tortillas. Quick pulled-pork tacos! If I’m counting correctly, that’s 7 meal portions so far–4 with the carnitas, 2 last night with the sandwiches, and 1 today with the tacos. When we use the bone and the meat that’s still clinging to it for soup or beans, that’ll be at least another 2 meal portions, and probably 4 or even 6. So that shoulder cost us somewhere between $1.50 and $3.00 a portion, depending on how the soup plays out. Amazing that there are people who won’t blink about spending hundreds of bucks for their fourth flat-screen TV but bristle at paying $23 for a cut of meat. Aw yeah. 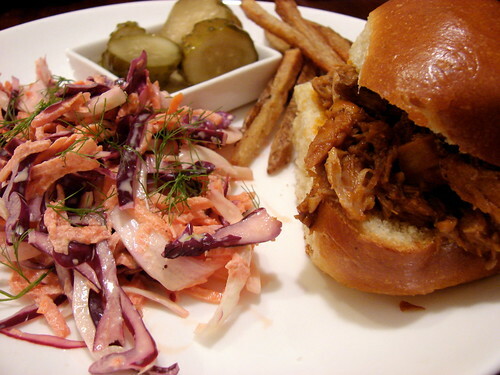 We make pulled pork relatively frequently (DPaul is from Kentucky, after all). It’s always so satisfying. The BBQ in his area is more like KC style, but not spicy, just sweet-tart and smoky. I like my slaw on the sammich, not on the side; DPaul begs to differ. and me with a large pork shoulder I bought for 3€/ kg currently lying in the freezer. I think the menu for half of next week’s done. Excellent. Great pics as ever. Btw, did you keep the skin and fat off the pork shoulder? I asked my butcher to cut it and I tried to make some scratchings. The results were a bit meh, ovens being still a mistyfying process for me and all, but I think it’s something definitely worth investigating. My stomach just rumbled reading this post – that pulled pork sounds delicious. I wholeheartedly agree with you on the large cuts of meat concept. dietsch – I shoulda fought you for those leftovers 😉 Thanks for doing the math, though. Sean – BBQ really just hits all the right notes, doesn’t it? I’m actually a fan of the slaw either way, on or next to the sandwich. Elise – Thanks! It’s nice to remind myself once in a while that an animal isn’t all steaks or chops or skinless, boneless parts, and to really use everything. Inspirational, as usual! I’ve passed on the link to this post to some others. I was just contemplating shredding some freshly braised / roasted chicken for bbq, and now? SOLD. I love the idea of brioche buns. Can. Not. Wait. to see what you have in mind for the marrow in that seemingly large bone. Marcos – if you let the skin/fat dry out overnight, uncovered in the bottom of the fridge, then rub in some coarse salt and roast it at about 200°C, you should get pretty good pork scratchings. Off to Borough tomorrow. Hmm. What to get? Thanks again for another inspiring post. As a single person who loves to cook, I enjoy reading posts like this in which planned leftovers are used in different ways. I typically end up freezing half of what I make to use at a later date (the other half is split into dinners/lunches for the current week), and it’s nice to get some ideas on how to “repurpose” the leftover meat. Your blog is one of my go-to sources! I absolutely love this site. You make beautiful, inspiring, seasonal dishes. Nothing goes to waste and the food looks absolutely delicious!! It’s funny–the first time we made pork shoulder, we ate so much of it that the leftovers were not so great–though we think that the shoulder just didn’t have a great meat yield. We made more last weekend using a recipe that was specific for a smaller bone-in roast, and those leftovers did turn into delicious cubanos a few days later.